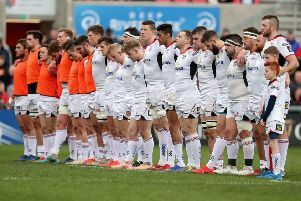 Head coach Dan McFarland was happy to see Ulster get the job done against Southern Kings on Saturday night in Belfast and take second spot in Conference B of the Guinness PRO14. 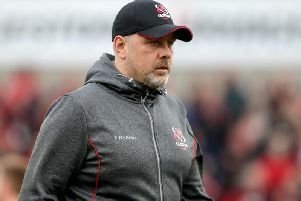 There were some apsects from Ulster’s performance that were disappointing, but McFarland was delighted to take five points. However, he was also left concerned about his injury situation as he looks ahead to a massive European Champions Cup quarter-final against defending champions Leinster in Dublin on Saturday. Fullback Louis Ludik was helped off by the medics after just nine minutes with a left leg injury and is almost certainly a doubt for next weekend along with Irish centre Will Addison who continues to battle with a back problem. Against the Kings South Africa international Marcell Coetzee, who returned to action for the first time since January, scored Ulster’s third try after Stuart McCloskey and Rob Lyttle had already crossed the Kings’ line. McFarland said: “We were a little bit disjointed today, three weeks off and it looked like we had three weeks off, turned the ball over in the first half seven times, for us that is very uncharacteristic, our ruck performances so far this season, or certainly in the second two thirds of what we have played so far have been excellent, and today that was the worst performance in terms of ruck and keeping hold of the ball that we have had in three or four months. “So we will certainly look at that, I will certainly look at it, because it was a focus for us this week in terms of what happened out there we did the same thing, we played a really good game tactically over there and turned the ball over a lot, as a consequence, even though we were comfortable winners we did not play as well as we wanted to. It was exactly the same tonight, the game was stop start and never had any flow to it. “The first half that was a result of couple of injuries obviously but also our inability to hold on to the ball consistently is something to look at,” he added.